Pure Almond oil with Ayurvedic herbs for enhanced effects. Contains only natural ingredients including fragrance. Almonds are of Rosacea family in the Amygdalus sub genus and the genus Prunus. They originated in the Levant region of the Middle East and have since been used worldwide in healing and culinary applications. Almond oil has several important nutrients including polyunsaturated and mono fatty acids as well as vitamins E, D, B1, B2, B6 and A. These are all helpful nutrients that support growth of strong, healthy hair strands. The high vitamin E content in almond oil is particularly helpful for conditioning the hair. Buy Almond Oil, Natural Hair Oil, sold & shipped by Fabulous India where you can shop online for Natural Holi Color Powder, Hair Oil, Henna Powder, Indigo & Vitamins. 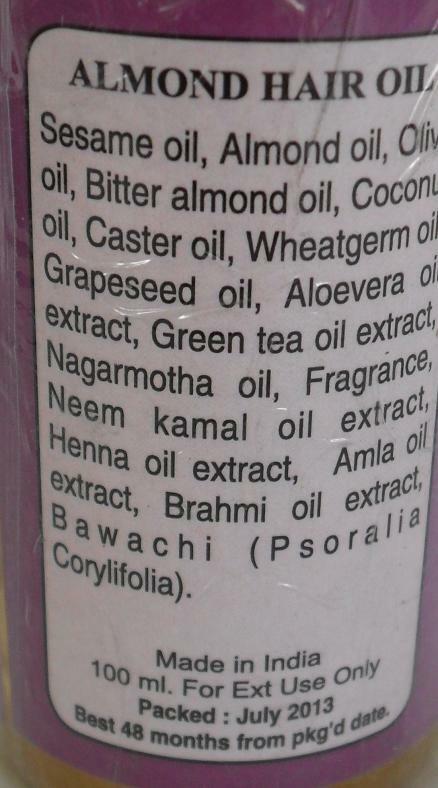 This Ayurvedic collection has been tagged as almond, hair oil, ayurveda, health, scalp massage, hair loss, hair growth product.